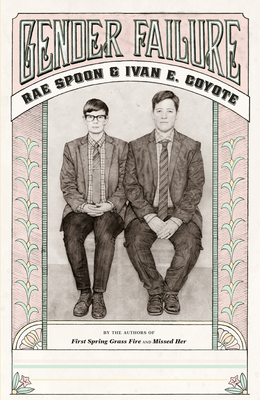 Ivan E. Coyote and Rae Spoon are accomplished, award-winning writers, musicians, and performers; they are also both admitted "gender failures." In their first collaborative book, Ivan and Rae explore and expose their failed attempts at fitting into the gender binary, and how ultimately our expectations and assumptions around traditional gender roles fail us all. Based on their acclaimed 2012 live show that toured across the United States and in Europe, Gender Failure is a poignant collection of autobiographical essays, lyrics, and images documenting Ivan and Rae's personal journeys from gender failure to gender enlightenment. Equal parts hilarious and heartbreaking, it's a book that will touch LGBTQ readers and others, revealing, with candor and insight, that gender comes in more than two sizes. Ivan E. Coyote is the author of six story collections and the award-winning novel Bow Grip, and is co-editor of Persistence: All Ways Butch and Femme. Ivan frequently performs at high schools, universities, and festivals across North America. Rae Spoon is a transgender indie musician whose most recent CD is My Prairie Home, which is also the title of a new National Film Board of Canada documentary about them. Rae's first book, First Spring Grass Fire, was a Lambda Literary Award finalist in 2013. Ivan E. Coyote: Ivan E. Coyote is the author of seven previous books, the most recent of which is One in Every Crowd. Ivan is also the co-editor (with Zena Sharman) of the anthology Persistence: All Ways Butch and Femme. One of her stories appears in the anthology It Gets Better, edited by Dan Savage and Terry Miller. Originally from the Yukon, she now lives in Vancouver.Rae Spoon: Rae Spoon is a transgender musician/writer/workshop facilitator from Calgary, Canada. Rae has been nominated for a Polaris Prize, toured internationally, and released six solo albums. Their first book First Spring Grass Fire was published in 2012 and shortlisted for a Lambda Literary Award.